Bali has some of the most amazing holiday villas available as your next holiday home. 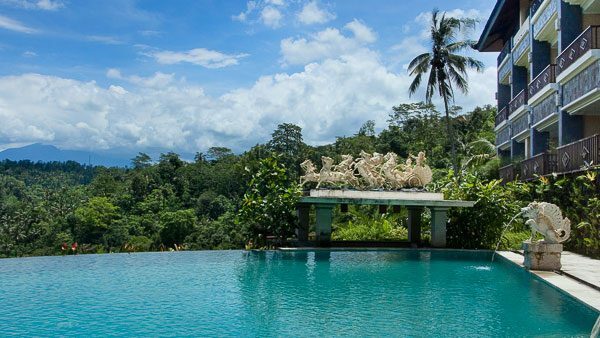 Whether you require a small 1 or 2 bedroom villa, or a larger 3, 4, or 5 bedroom villa to accommodate your family and friends, Bali has an enormous range of villas that mostly come private pool, landscaped gardens, and personal staff. Some are privately owned with their own staff, and some are part of a resort. Here’s just a few. Living at the Rijasa Angung Resort is an experience in itself. Redefining luxury like no other, the resort is secluded in a hill-side area and has a large infinity pool where you can swim all day. It would not be wrong to say that this one is definitely more like a luxurious sanctuary where you can relax and unwind, having no care in the world. 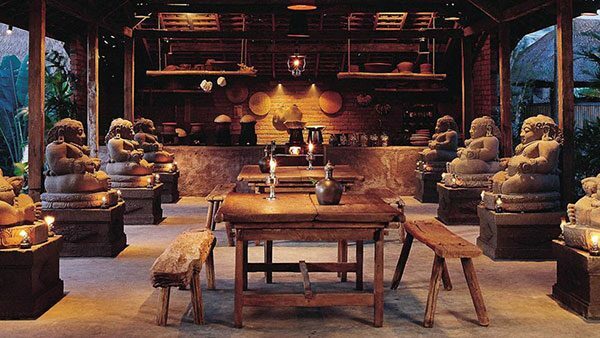 This exotic resort also houses a two-storey restaurant that serves culinary delights from around the world along with mouth-watering local cuisines. 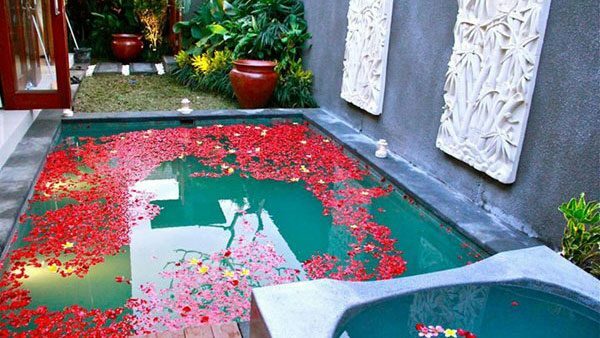 Rijasa Angung Resort also offers a special honeymoon package that includes a traditional Balinese massage for couples, candlelight dinners and exotic flower baths. Rates for booking at this resort start from $ 151 and higher depending on the package you select. The honeymoon package is slightly more expensive than other packages. 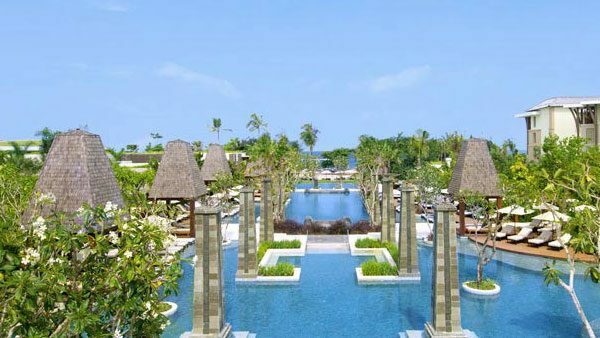 Indulge in French luxury like never before at the breathtakingly beautiful Sofitel Bali Nusa Dua Beach Resort. Charging $165 per night, this beach resort is not only rich in scenery but also makes your comfort its number one priority. Associated with the leading French Sofitel Luxury Hotel Group, all suites and villas at this luxury resort are fitted with Hermes amenities – giving you the opportunity to experience the French and Balinese culture at its finest. 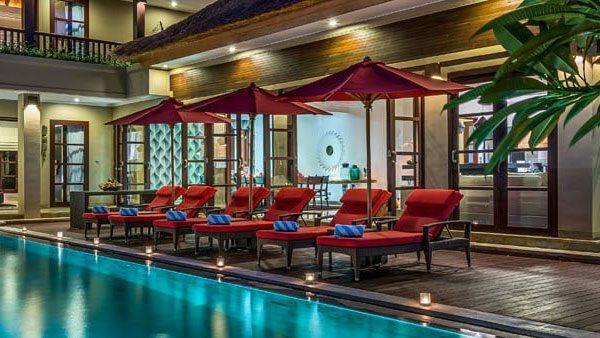 That’s not all – Sofitel Bali Nusa Dua resort has got a lot to offer: you will get access to its luxury lounge, cocktail parties, wine tastings, lagoon pool and a private beach where regular jet skiing and boating excursions take place. 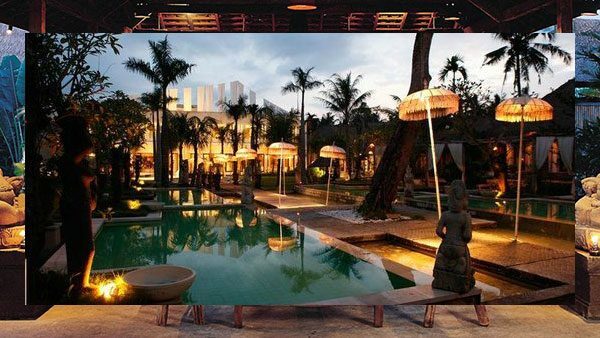 Set in the very heart of Seminyak, Villa Nilaya is strategically located in an upmarket area and within walking distance of many high-end bars, restaurants, and clubs, as well as the beach. With prices starting at around $600 per night, this privately owned luxury villa has 5 large bedrooms that can easily accommodate 10 guests, as well as huge gardens, a big pool, and a modern kitchen area. The villa always comes fully staffed with a butler, chef, and driver to take you anywhere you wish to visit. While booking this villa for $200 per night may seem like a splurge, it is definitely worth it. This beautiful villa reminisces the ancient past with its ancient getup designed especially for those who like to live in luxury. They say, attention to detail is key and the decorators of this villa have done just that. Each and every room of the villa has been painstakingly crafted by local artisans and decked with priceless antique collections – taking you straight to the olden days of Balinese kingdoms. Overlooking rice paddy fields and the ocean, this spacious villa features private plunge pools and luxury spas. What truly sets Hotel Tugu apart from all the other villas is the rich, opulent experience it offers. Imagine touring the facility in a horse carriage or just spending a quiet day with your loved one in your very own private Jacuzzi. The best part yet, the entire facility is safe and secure, guarded by security personnel and surveillance systems 24/7. Located in a prime location, the Legian Kriyamaha Villas offer its customers the best of the best of everything. Sporting a romantic theme, living at the Legian Kriyamaha Villas is like a dream come true for young and mature couples alike. Whether it’s your honeymoon or just another romantic getaway, the Legian Kriyamaha Villas has a wide variety of romantic services waiting for you and your beloved including flower baths, candlelight dinners, floating breakfasts and lunches as well as a private pool and Jacuzzi. Another mention-worthy advantage of living at the Legian Kriyamaha Villas is that the Seminyak Square, Double Six Beach and Kuta Beach are only 15 minutes away from the location. With rates starting from $103 per night, the Legian Kriyamaha is an experience you cannot afford to miss. If you’re planning on availing luxury spa services throughout your stay in Seminyak, then look no further because The Mansion Resort Hotel & Spa is definitely the place to be. Offering the best spa treatments money can buy, living at the Mansion Resort Hotel is truly a one-of-a-kind experience that will make you want to stay in Bali indefinitely. Each room at the Mansion Resort Hotel has been tastefully decorated with the finest furniture and rare traditional Balinese art pieces that you can marvel over. The striking feature that makes this luxury hotel a number one choice for most travelers is that it even has an on-site art museum that you can visit any time you want along with other premium services. Starting at $ 98 per night, The Mansion Hotel & Spa is an ideal destination for art lovers and curious travelers.